Sam Spinner ridden by Joe Colliver will run in the Ryanair Stayers' Hurdle next month. Jedd O’Keeffe hopes Sam Spinner can go one better than finishing second at Cheltenham by winning the Ryanair Stayers’ Hurdle at Aintree next month. Leyburn-based handler O’Keeffe felt his stable star was back to his best in chasing home the brilliant Paisley Park in the Sun Racing Stayers’ Hurdle. With Emma Lavelle’s champion unlikely to make Liverpool, O’Keeffe would be happy to take Sam Spinner to Merseyside and try to improve on his third place last April. “I was absolutely thrilled. It was great to see him back to pretty much his best. “Marvellous, a really good team effort getting him back there,” said the North Yorkshire handler. “He’s come out of the race 100 per cent. We’re really happy with him. 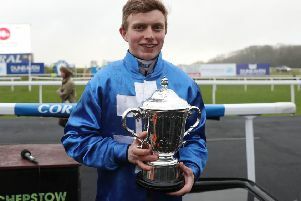 O’Keeffe gave credit to jockey Joe Colliver, who put a pending court appearance for drink driving to the back of his mind and concentrated on the ride on Sam Spinner. “Joe gave him a fabulous ride, which is what I was hoping for,” he said. “We were all aware of what’s going on, but he knows the horse better than anybody. “He knew what he had to do to get it right. We were all thinking about how it might have affected him mentally, what was going on. Another horse of O’Keeffe’s likely to head to Aintree is Lord Yeats after his smooth victory at Hexham last week. “He’s come out of his race really well. We’re thrilled with him. We’ve no choice now but to have a go at something better,” said O’Keeffe. 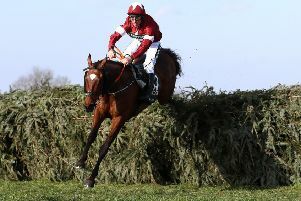 “He might go for the conditional and amateurs handicap hurdle at Aintree, the last race on National day. “And then he’s qualified for a big novice handicap hurdle at Sandown at the end of April. That might be his last race jumping for the time being. “That’s the target, a £100,000 novice handicap. The leading jockey made made the shock announcement of his impending retirement after steering the Willie Mullins-trained Eglantine Du Seuil to a narrow victory at the Cheltenham Festival on Thursday. The 43-year-old did not give a retirement date at Prestbury Park, but then confirmed yesterday he will hang up his saddle this weekend. Fehily said: “Saturday will be my last day riding. I didn’t want to drag on my retirement once I had made my announcement. It was always going to be sooner rather than later. I lived in Lambourn for nearly 16 years, and Newbury has always been a local track. They will be conducted alongside a British Horseracing Authority jockey coach before racing at the three-day meeting from April 4-6.